What is the economic effect of the University of Oregon on the state? Plenty, according to a study by Tim Duy, MS ’98, PhD ’98, an adjunct assistant professor of economics at the UO. Some highlights of the study are below. Duy is director of the Oregon Economic Forum and monthly publishes the UO Index of Economic Indicators, a measure of Oregon economic trends. The University’s total economic impact on the state of Oregon for the 2009–10 fiscal year was $1.97 billion. 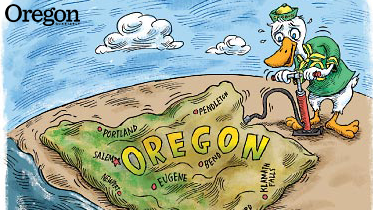 The UO is tied to $1 out of every $84 in Oregon’s economy. The UO produces $33.64 in economic impact for every dollar it receives in state appropriations. The University had 5,799 employees and directly or indirectly supported 13,247 jobs in Oregon, with associated household earnings of $658 million. UO researchers brought in a record $135.6 million in competitively awarded external funding (2009–10), and the University’s 137 percent growth in research expenditures over the past decade is eleventh best among sixty-three institutions in the elite Association of American Universities. The UO generated an estimated $35.5 million in state income taxes, based on total aggregate earnings tied to the University. That offsets the state appropriation of $58.5 million received by the UO and brings the net cost of the University to the state down to $23 million. The decline in state funding has been largely mitigated by an increase in revenue from tuition and fees—fueled by surging numbers of students. The UO’s total of $243 million in tuition and fees more than quadrupled the state’s funding for the University in 2009–10. Duy cites the UO’s ability to attract nonresident students as critical in light of declining state appropriations. The spending by nonresident students on tuition, housing, food, and other expenses represents new dollars flowing into the Oregon economy—economic activity that would not otherwise take place in Oregon. The University’s greatest impact on the state economy is the increased earning potential of its graduates. U.S. Bureau of Labor Statistics figures indicate that twenty-five-year-old high school graduates who were employed full-time in 2009 had median weekly earnings of $626, while twenty-five-year-olds with bachelor’s degrees had median earnings of $1,025. The full report is available at www.economicimpact.uoregon.edu.